Easypack/POP Displays, part of the Fencor Packaging Group, have invested in yet another one of Hewlett Packard’s high tech digital printers, the fourth in the past four years. 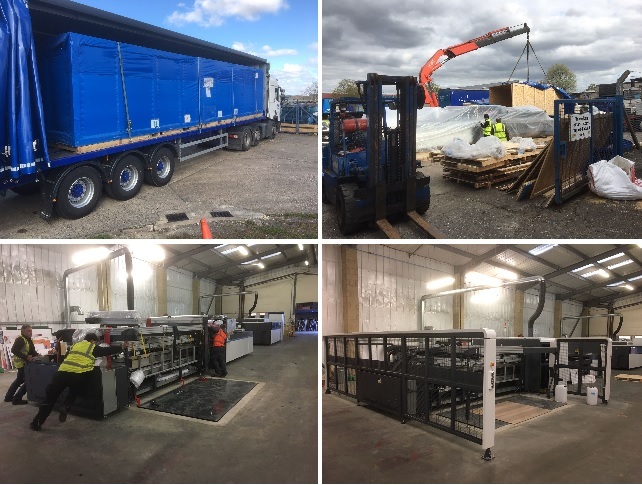 This time, it’s an HP Scitex 17000 corrugated press which is known for achieving cost-effective, short, medium and long run production which replaces a previous HP model purchased in 2014. With 8 channels, and HP’s HDR printing technology, this 4 colour press can print at speeds of up to 1000 m2 an hour. The way the HP Scitex handles the corrugated sheets means increased productivity due to stack-to-stack loading and automated media handling and the HP Scitex Corrugated Grip handle board warp up to 40 mm so there’s no slowing of production if a slightly warped board finds its way onto the stack. With HP Scitex High Dynamic Range (HDR) printing technology we have eliminated quality versus productivity trade-offs. We now achieve consistent, super high-end performance and quality that rivals flexo and offset printing, as well as the productivity rates expected from high tech industrial digital presses – at the same time. The HDR gives us precise control over tone and colour for great clarity and image detail. It helps us to produce print with the highest dynamic range which makes it perfect for retail graphics and POP displays corrugated displays, and packaging applications with high-impact graphics. It’s now possible for us to produce dots with up to 16 grey-levels for subtle shading in images, with low grain and very smooth colour transitions. The ability to precisely place the dots means the text, bar codes, and graphics we produce are perfectly sharp and clear. HP’s UV-curable inks afford a wide colour scale which meet ISO standards for proofing and, importantly, are certified for low chemical emissions as demanded by the stringent UL GREENGUARD Gold standard. This £1.2million investment lifts the production capacity of Easypack/POP Displays to 2.7million square metres – or approximately 900,000 average sized display units … an increase of 415% over four years ago. This entry was posted in Blog, Easypack POPhelp, POP Displays, Print. Bookmark the permalink.